Welcome to our new blog location. We decided to move our blog from Blogger to WordPress for several reasons. 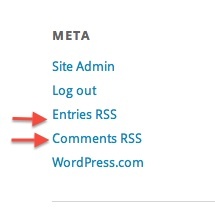 While it can be argued the both are just about the same, WordPress offers more of what I want in a blog site. I may choose to copy our old blog posting to this location or I may just leave them where they are for now. There is a link on the right side of this page that takes you back to the blogger location. Those postings will forever be there until I decide to move them to this location. On the right side, under MENU, the link “Who Are We” will take you to a section that tells the reader a little about us. For those who have bookmarked http://www.waggintailsrv.com, you will notice no change in access our blog. For those who wish to subscribe to our blog, scroll down below the META section and click on either the Entries RSS link or the Comments RSS link. These links will allow you to receive updates to our blog as new posts are published. I am looking at a way to include our current blogger followers. Finally I ask that you provide constructive feedback to the new look. I am open to any positive suggestions. This entry was posted in Site Info and tagged Site Info. Bookmark the permalink. Hey, I found you! Nice to see a photo of South Forty. Wondered what it really looked like. Nice. Pretty nice little place. My wife has family in Giddings. My brother is in Burton just outside of Hempstead.